With the gift-giving season round the corner, you might be tempted to get all your shopping done online—but that would be a shame because nothing beats the magic of a real toy store this time of year. Whether you are looking for traditional wooden toys, obscure manga characters, beautifully crafted bears, or just a giant box of LEGO, the following toy shops around the world will cater to your every toy-related need. 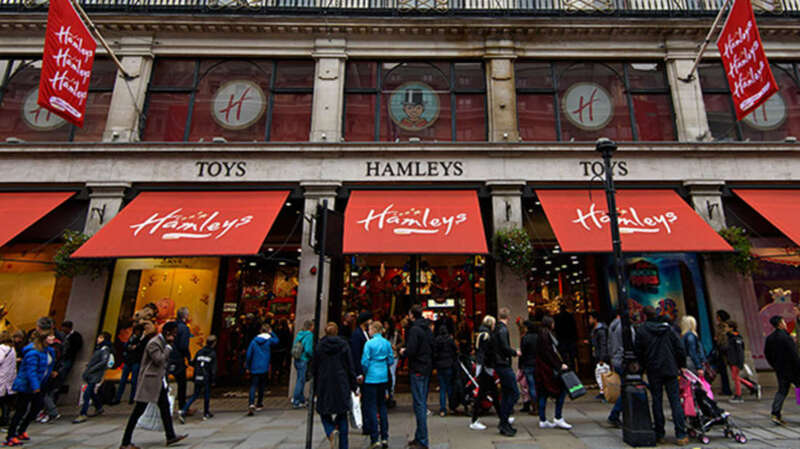 Hamleys in Regent Street, London is one of the world’s most iconic toy shops, and 5 million people a year still flock to this paradise of playthings to get their fix of the latest toys. Founded in 1760 by William Hamley, who initially named his High Holborn store “Noah’s Ark,” the store did so well that another (this time eponymously-named) branch was opened in Regent Street in 1881. Over the years, Hamleys has had many up and downs—closing for a time during the economic depression of the 1930s, remaining open despite getting bombed five times during World War II, and putting on a grand display of toys at the 1951 Festival of Britain—but it has always remained a London institution. Today, Hamleys has seven floors full of toys, games, puzzles, and dress up, and a visit to the shop is always enlivened by their famous in-store toy demonstrations. Lark Toys in Kellogg, Minnesota is more than just a huge family-run toy store—they also have a working carousel with beautifully carved and painted animals, an 18-hole outdoor mini-golf course, a kids’ bookstore, and a fudge and candy store. Lark stocks a huge variety of traditional toys from puppet theaters, with plenty of interactive areas for the kids to get involved. There is also a charming display of antique toys in their “memory lane” section, which serves as a mini-museum. The super-stylish Kid’s Cavern toy store in Sands Coati Central in Macau opened in 2012 and boasts an interior designed to amaze. The 35,000-square-foot shop has giant superheroes, bright LED light displays, and an actual flying toy plane. The shop stocks children’s clothes and accessories as well as plenty of toys from all the biggest brands, but the element sure to brighten every kid’s day is the magical candy store containing every color and variety of sweet thing imaginable. Newly opened in November 2016, the LEGO Store in Leicester Square, London is the largest in the world at 9800 square feet. The store is furnished with many huge LEGO models, including a life-sized display of a London Underground train (created from an astonishing 637,903 bricks) and a 20-foot high model of Big Ben (which took 2280 hours to build) complete with a working clock face that is illuminated at night. There are also numerous nods to the store’s London location, with LEGO William Shakespeare, a bowler-hat wearing mascot, and a LEGO version of the iconic London tube map. Of course alongside all these marvelous giant LEGO models, shoppers can also buy just about any LEGO set they can think of. The most famous teddy bear manufacturer in the world is Steiff, which was established in 1880 in Germany by the remarkable Margarete Steiff, who created the now world-famous brand despite a serious disability due to childhood polio. The iconic Steiff teddy bear was designed in 1902 and came to international prominence at the Leipzig Toy Fair in 1903, when Hermann Berg, a toy-buyer for an American company, saw the potential and put in an order for 3000. Marketed as “teddy” bears in America, after President Theodore “Teddy” Roosevelt, the bears proved a massive and enduring success. Today children can visit the town where it all began and take a tour of the Steiff Museum and Factory, with a huge display of the many animals produced over the years. Alongside the museum is a large shop selling the complete range of Steiff animals, from a classic teddy bear to a giant giraffe. For bear lovers keen on a bargain there is also a factory outlet just outside the museum which sells discounted Steiff toys. Located in one of the most beautiful covered arcades in Paris, Si Tu Veux, in the City of Light’s 2nd arrondissement, is a proper old-fashioned magical toy store. The quaint shop stocks traditional European wooden toys, games, dress-up costumes, and puzzles, and is sure to enchant even the most jaded child away from their iPhone. Located in the famous Harajuku district of Tokyo, Kiddyland’s flagship store is perhaps the coolest toy store in the world. Kiddyland is famous for stocking original Japanese toys, many of which are only available in Japan. A paradise for character fans, there are four floors of Hello Kitty, Rilakkuma, chicaboos, Snoopy, tamagotchis, and numerous other cute Japanese brands. The Little Dollhouse Company in Toronto is one of only a few dedicated dollhouse stores in North America. The store includes 85 built dollhouses to explore, each fitted out with miniature furniture. The store also includes a workshop where visitors can watch craftspeople create everything from tiny bowls of cereal to elaborate miniature chandeliers. The shop caters to everyone from those looking for their toddler's first playhouse to avid collectors salivating over the $50,000 mansion. Charles Ro Supply Company, in Malden, Massachusetts may be America’s largest toy train shop, with 30,000 square feet of the largest inventory of model trains in the country. Every Saturday between 10 a.m. and 4 p.m. they run their whole electric train on six different tracks across three separate floors. The track runs G-gauge and O-gauge trains through varied scenery that includes waterfalls, a mountain pass, a town, and an old-time depot, all ensured to delight children and adult collectors alike. Forbidden Planet is the world’s largest chain of comic book stores, and the London megastore on Shaftesbury Avenue is its spiritual home, packed full of merchandise connected to comics, manga, sci-fi, and cult TV shows. Expect shelves heaving with Dr Who, Star Wars, Adventure Time, Marvel, and Buffy the Vampire Slayer merchandise.